Part Used & Method for Pharmaceutical Preparations: The heart wood of dalbergia odorifera is sawed into small pieces, then dried in the shade. 1. Qi and blood stagnation manifested as stifling sensation in the chest and hypochondriac pain. Dalbergia wood (Jiangxiang) is used with Curcuma root (Yujin), Pilose asiabell root (Dangshen), Peach seed (Taoren) and Vegetable sponge (Sigualuo). 2. Swellings and pains due to external injuries. 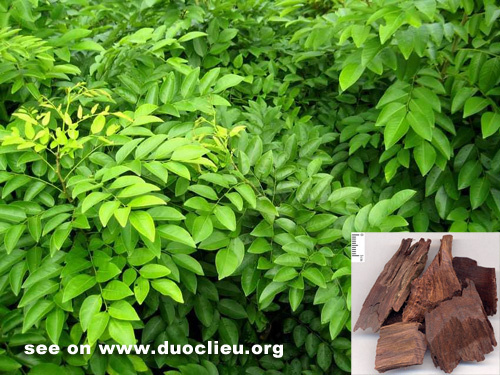 Dalbergia wood (Jiangxiang) is used with Frankincense (Ruxiang) and Myrrh (Moyao). 3. Interior turbid dampness with vomiting and abdominal pain. Dalbergia wood (Jiangxiang) is used with Agastache (Huoxiang) and Costus root (Muxiang). 4. Hemorrhage and pain due to external injuries. Dalbergia wood (Jiangxiang) can be used alone, externally. Dosage: 3-6 g; 1-2 g for powder.